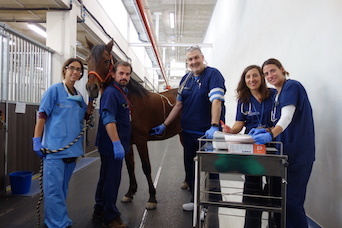 Developed by a group of veterinary professors in Spain, this new technology makes it possible to obtain electrocardiograms with nothing more than a smartphone. Professors of veterinary medicine from Cardenal Herrera University in Valencia, Spain have created a simple way to identify arrhythmias in horses. Keeping in line with adaptive technology that dominates much of the modern world, the group’s new smartphone application makes it possible to obtain equine electrocardiograms (ECGs) with nothing more than a smartphone. Ignacio Corradini, MV, MSc, MRCVS, head investigator of the study, explained that apps to monitor health are not only more present in the daily lives of people, but they also have growing uses in veterinary medicine. The group’s research was exhibited recently at the annual congress of the European College of Equine Internal Medicine and is slated for publication in an international equine journal. For their study, the investigators evaluated the accuracy of the smartphone app on 50 horses both with and without prior arrhythmias. The testing was conducted on both sides of the horse’s thorax. According to the group, the results exceeded expectations and the mobile phone proved to have high sensitivity for detecting and characterizing the cardiac arrhythmias of horses.